"The Miserable Mill: Part Two"
First things first, a phrase which here means “I’m struggling to figure out how to begin this review so let’s just dive right the heck in:” I was wrong about “Mother” and “Father” not having much point in the show. It turns out their brief scenes served as a way to introduce a pair of children who will become important next season, kids with an origin story suspiciously close to the Baudelaires’ own. I’m still not convinced the build-up works, or was all that necessary (given that we learn nothing about the kids, it’s like this storyline ends right where it should be starting), but it’s easier to understand the justification behind it. Maybe the best way to accept the flaws in Lemony Snicket’s A Series Of Unfortunate Events’ first season is to see all of this as some kind of learning curve. The show wants to get a lot of information in the hands of its audience, but it also wants to hold onto its secrets. It wants to tell the story of plucky orphans fighting against impossible odds, but also serve as a kind of parody and commentary of the sort of po-faced kid’s books that have told similar stories in the past. (After all, most kid lit is a series of unfortunate events, there are just usually more hugs at the end.) And it wants to have an effective villain, while also providing a showcase for a talented actor and singer to goof around on camera. “Part Two” is stronger than “Part One,” partly because it gets to shoot all the guns we saw loaded last time around. The interplay between Orwell and Olaf is a fine change of pace from the usual browbeating the count gives his henchpeople (who, apart from the Hook Handed Man, take this storyline off), and the confrontation between the Baudelaires and the baddies is the most thrilling the series has done yet, with some real suspense over the outcome. There are the usual time-filling indulgences, of course, but some of those actually work, including a final song montage which gets points for unexpectedness and melancholy. That song, and most everything else on the show, is struggling to find a tone that I’m not sure exists: it’s not quite black comedy, it’s not quite satire, it’s not quite fable, it’s not quite allegory, but it’s a mixture of all those things at once. It’s easy to overlook the challenge of that, and it’s impressive how well the series has managed it—it’s not perfect, but it’s successful enough that, if you’re the sort of person who’s into this, you’re going to be more than willing to overlook the flaws. 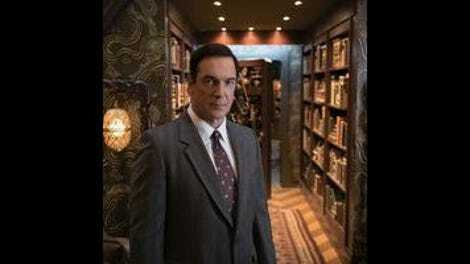 Getting the tone right—which means not just the performances and the scripts, but also the look of everything, and the score—is critical for any ASOUE adaptation to work, and the fact that this one managed to more or less sustain a vibe over the course of eight episodes is worth noting. Really, the thing that holds this back from greatness, what makes it enjoyable but often frustrating and badly paced, is the constant intrusion of material that should’ve been left on the cutting room floor. Take the opening scene of Mr. Poe freaking out over the missing kids. Story-wise, it sets up the fact that Poe has no idea where the Baudelaires are; that he’s in danger of losing his comfy position if he can’t find them; and that his wife volunteers to search them out herself. None of this is particularly necessary information. Mr. and Mrs. Poe show up at the end, and she explains how she found the children (literally “by accident”), and that’s all that’s really necessary. It’s not as if we would’ve forgotten Mr. Poe existed if we didn’t see him for forty minutes. This is tricky, because K. Todd Freeman and Cleo King are both quite good in their roles (Freeman especially; he manages to make Poe useless, irritating, and vaguely endearing all at once), and the scene in question isn’t, on its own, a bad scene. It’s funny, and watching Mr. Poe freak out over losing his “#1 Banker” pin is a hoot. But just because something works on its own doesn’t mean it works in the larger context of the show, and, funny or not, what this scene mostly does is slow things down, and distract us from what’s really important. There are bits like this throughout the season, some more entertaining than others, but their cumulative impact is to diffuse any rising energy and render each entry into a little less than the sum of its parts. Earlier in this review series, I mentioned that the formula of the books (and the show) could get tiresome, and it does make sense that Daniel Handler, adapting his own work with a few other writers, would want to try and offer some variety. Count Olaf and Mr. Poe (and Lemony, although his intrusions all pretty much work) are comic in a way the Baudelaire orphans can’t be, which must make them very tempting to write for; and since their scenes are usually fairly funny even at their worst, it must be easy to justify leaving them in when you’re already trying to add some variety. But all this really does is rob the narrative of one of the things that makes the books so compelling: sticking with the Baudelaires and discovering the secret corners of their world along with them. Perspective is an incredibly useful thing in drama—it encourages identification and can generate suspense—and by flattening everything out, the children’s plight seems more of a nuisance than a calamity. Olaf does fail, after a tense set-piece that has Klaus nearly sawing poor Charles in half. (Phil gets his leg comically, if horrifically, smooshed, but it’s not a bad enough accident for Sir to let the kids go immediately). As mentioned earlier, this is really Dr. Orwell’s show, which is a nice change of pace; somebody was going to die, and having her end up in the furnace (a Sweeney Todd reference?) was better than seeing yet another good-natured, short-sighted innocent thrown to the wolves. Although the staging is a little forced. I expected Olaf to do the dirty work himself, but ultimately the only person responsible for Orwell’s death is her own clumsiness; shocked at a sudden rush of unhypnotized millworkers, she tips backward into the flames, throwing Sunny clear as she falls. It’s messy, but in the end, the status quo, more or less, is restored; Mr. Poe rediscovers the Baudelaires too late to have any impact on the story (and of course he doesn’t believe anything they tell him), and he brings them to their next home, the Prufrock Preparatory School. (In a nice touch, the campus, which was designed by a very depressed person, looks like a giant graveyard.) We’ll have to wait for next season to find out what awaits them there, but one final tidbit—a photo from the school’s past that shows younger versions of Lemony and Olaf standing side by side and smiling—is maybe the most intriguing piece of mythology yet. The Baudelaires get confirmation from Charles that their parents were actually responsible for putting out the fire. Klaus also gets back the missing half of the spyglass from Jacquelyn. This is a very petty complaint, but Violet tying up her hair always looks less natural than it should. Mr. Poe’s “I do want you children to know *cough* I hope you find comfort here,” was oddly moving. The real pain of his character is that, in his befuddled and utterly impotent way, he really does mean well. But “meaning well” and “doing well” are two very different things. Till next time, unless you find something better to do, which I really think you should.